X_STUDY 7.9.20 now supports chart creation using custom spread formulas. Users may drag and drop any Autospreader Custom Spread Formula directly into a X_STUDY chart. X_STUDY 7.9.20 now supports net change chart requests. Note: X_STUDY 7.9.20 and higher require FMDS 7.6.0 or higher. Regroup a split Time Price Area (TPA) by clicking on the TPA that has been split. Re-center the last traded price on a price distribution chart using the space bar. Display a tool tip on a price distribution chart when mouse hovers over a TPA. For more information, refer to Price Distribution Context Menu. X_STUDY 7.8.1 and higher now display critical error information directly in the title bar context menu. In addition, X_STUDY now continues to display charts following the exchange close or after the TT Gateway is taken offline. To help users readily identify the status of a specific chart, X_STUDY now displays a color-coded icon directly in the window. For more information, refer to Chart Error Messages and Viewing the Current Chart Status. 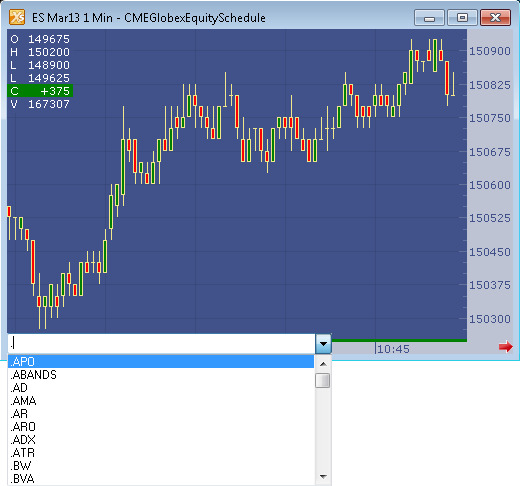 Spread charts that do not have a matching Autospreader® definition. 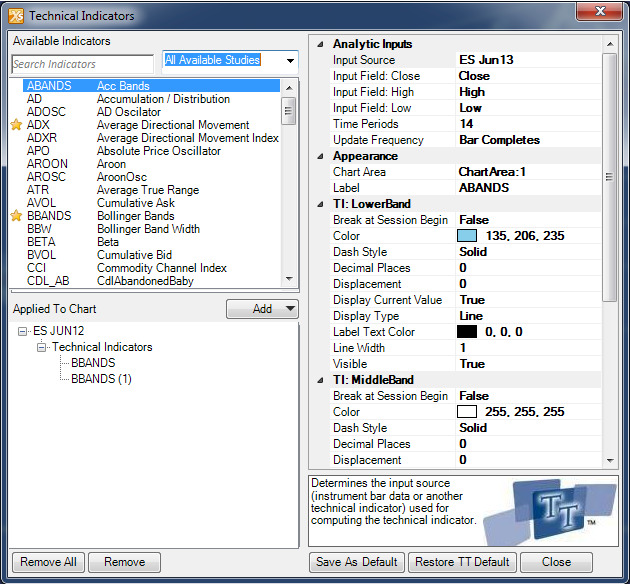 Changes to the default properties of a technical indicator. Please note this change only affects X_STUDY® charts and will not affect the other X_TRADER® workspace components. We apologize for the inconvenience. We have more than doubled the amount of technical indicators available for use within charts. Please refer to List of Technical Indicators for a complete list of the indicators available. In addition, a new now appears when adding studies to the chart. You can add, remove and modify all your studies from this one window. Additional features of the window include the ability to mark studies as favorites and search through the list of studies. Studies marked as favorite create a quick access list found in the context menu as in the prior releases of X_STUDY. The difference is this list contains only the studies marked as favorite. The commandline has been enhanced to support adding technical indicators to the chart. On a chart loaded with a contract you can type a period (.) and the commandline will list all available studies to add to the chart. Each bar in X_STUDY® now has additional values along with the Open, High, Low and Close. 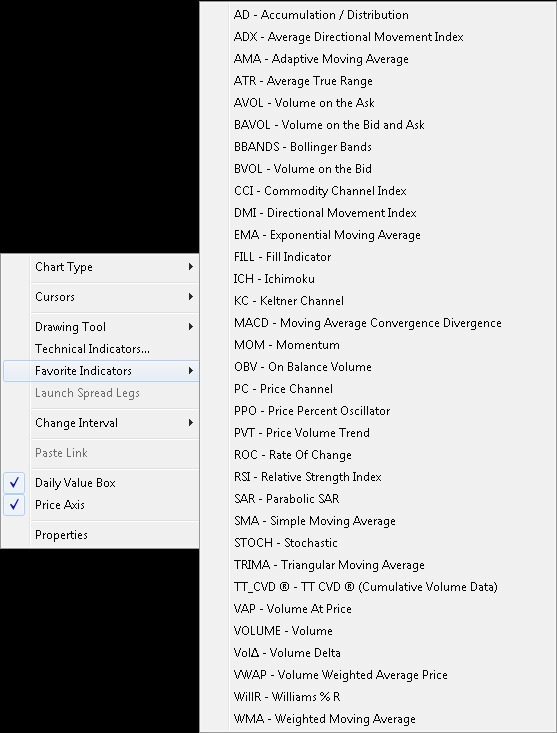 The Volume-At-Price (VAP) list inside each bar is used to calculate the Volume Weighted Average Price (VWAP), Max VAP, Value Area High (VAH) and Value Area Low (VAL) for each bar. A user may also choose from these new values when configuring studies. 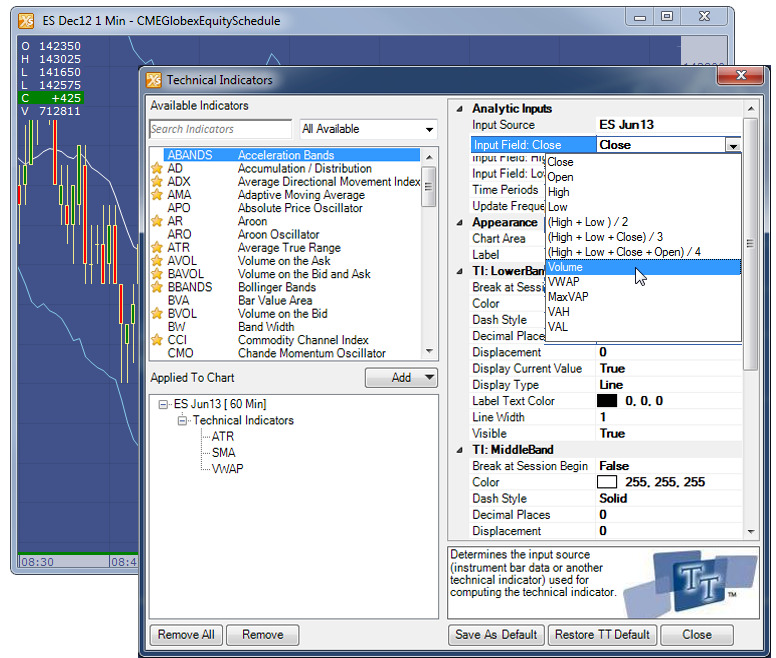 This feature creates a new generation of technical indicators using the same formulas. 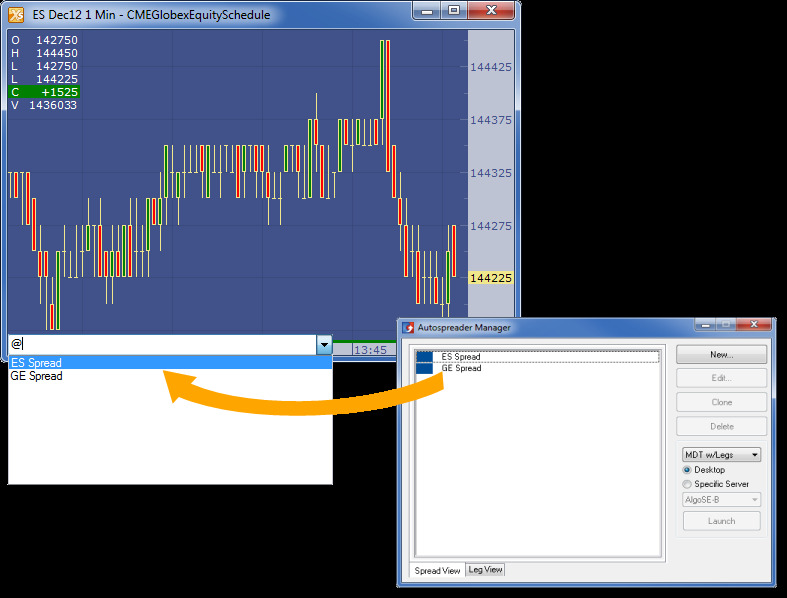 For example, a simple moving average can now calculate on the VWAP of each bar instead of the Close. You now have the ability to place a study on a study. Typically, studies calculate on bar data, but now you can have a study calculate on another studies output. The example below demonstrates a study on a study by adding two simple moving averages to the Volume on the Bid and Ask (BAVOL) indicator. You can now place more than one study on the same chart area. In the Technical Indicator dialog box you will find a new property named Chart Area that allows you to select the area the study will be placed. You may place more than one study in each area, as outlined in the example below. Refer to for more information. 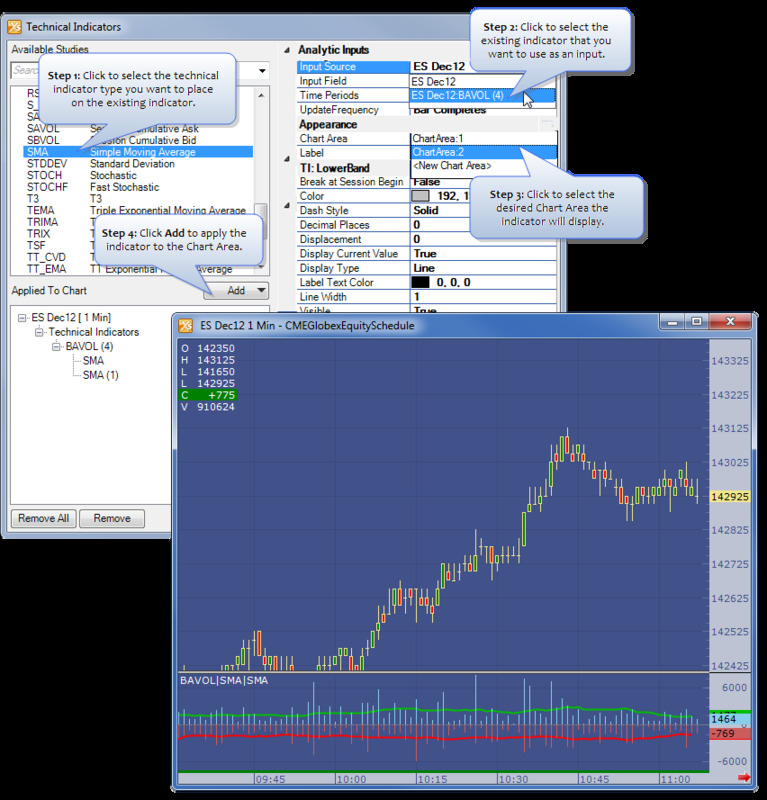 X_STUDY 7.8 removes the spread builder as we continue to integrate with the X_TRADER platform. 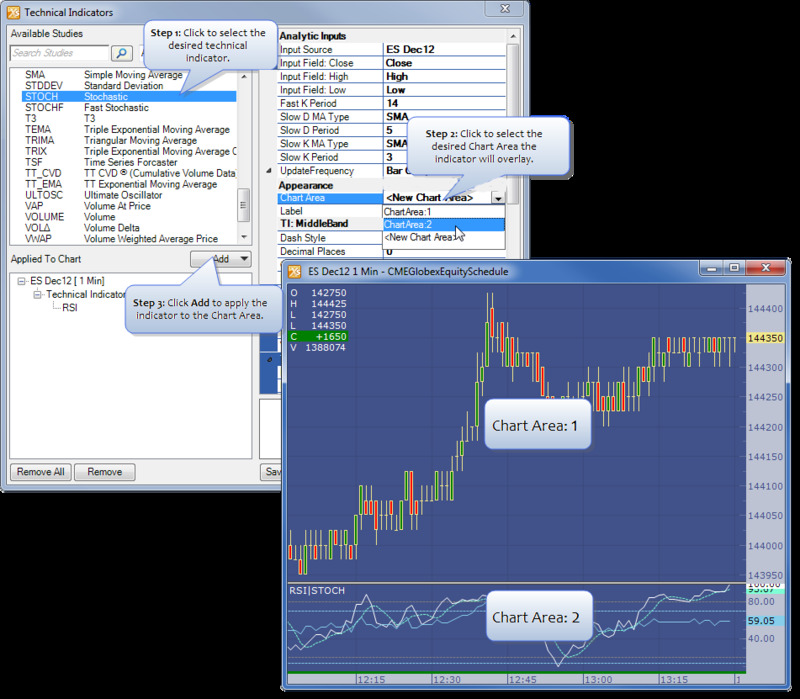 Spread charts are still created using the Autospreader definition. You may still launch charts from several menu items in the X_TRADER platform, by typing the '@' character in the chart or by using the drag-and-drop method. By removing the spread builder we now ensure that spread charts configured in Autospreader match the price displays used in X_TRADER. New Net Change calculations now match X_TRADER and Autospreader Net Change implementations. Charts fully update when any changes are made in the Autospreader definition. For example, changing the contract and the multiplier will recreate any existing charts using the Autospreader definition.